CBS Sports Network will roll the dice tonight with some interesting quirks to hopefully draw in more viewers to Navy’s Blue-Gold game broadcast at 7 p.m.
Players will wear microphones, coaches will do fourth-quarter interviews and cameras will be present in the locker room. We’re talking HBO Hard Knocks-level access, although I can imagine it won’t have the same production value. Wide receiver Doug Furman and cornerback Kwesi Mitchell will wear microphones throughout the game giving viewers a sense of the on-field chatter. Head coach Ken Niumatalolo has also agreed to do a fourth quarter interview. 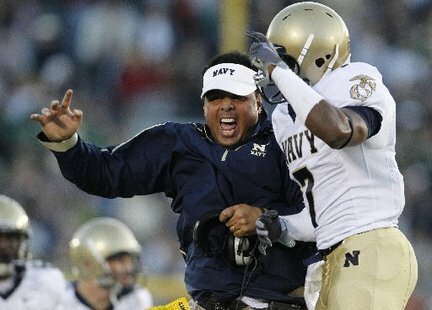 CBS producer Dan Scheer got the idea to take some chances with Navy’s Spring Game after Niumatalolo agreed to wear a microphone during a 2008 game against Temple. CBS is going to have to add some manufactured intrigue to a game in which Niumatalolo intends to hold out 20 starters, including co-captains Alexander Teich and Jabaree Tuani.